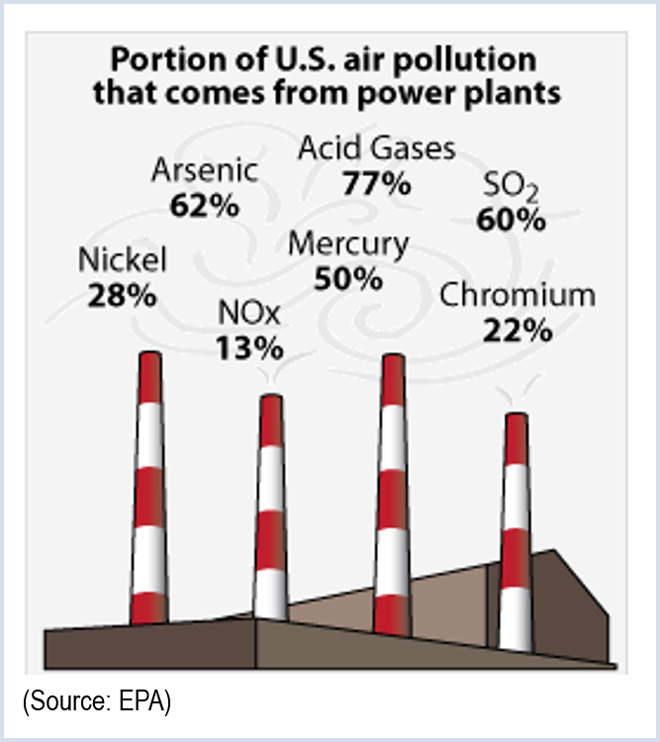 American Electric Power and FirstEnergy plan to shut down more than 9,200 MW of coal-fired generation and invest hundreds of millions to keep other plants operating under the Environmental Protection Agency’s Mercury and Air Toxics Standards (MATS). “We have been investing in, operating and staffing the generating units scheduled for retirement in a way that would not support their continued operation past their planned date of retirement,” AEP spokeswoman Tammy Ridout said Monday. Indeed, about 90% of the capital expenditures needed to meet MATS compliance have already been spent, attorney Paul M. Smith, representing Calpine and other generators, told the justices last week. AEP and FirstEnergy aren’t alone in downplaying the potential impact of the court’s ruling on the queue of coal plants headed for the gallows. “I think it’s pretty unlikely that anything like a majority of the plants announced for retirement could be backed off on,” agreed Anne Smith, co-chair of NERA Economic Consulting’s global environment practice. 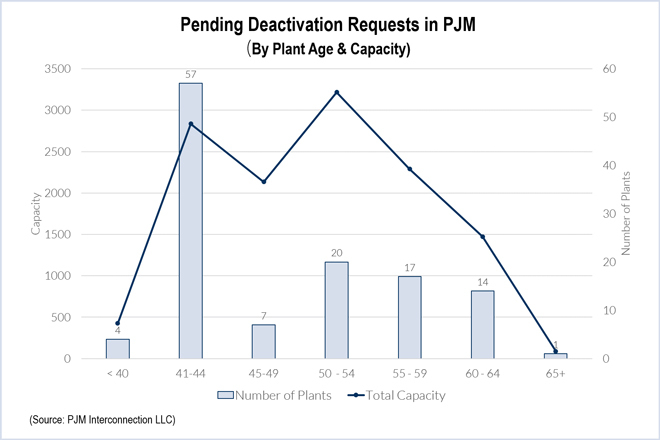 While the court’s ruling will be too late to provide a reprieve for most of the old, small plants targeted for retirement, it could have an impact on EPA’s efforts to reduce emissions from electric generation. A ruling that requires EPA to take costs into account when it decides what to regulate — as opposed to when it sets the standards — could have broad implications. Some environmental attorneys say the Supreme Court decision to hear the MATS challenge could indicate it is reconsidering its 2009 decision that held EPA had discretion on how to consider the cost of regulating large cooling water intake structures under the Clean Water Act, which doesn’t expressly authorize or forbid the use of cost-benefit analyses. A ruling that found it was “arbitrary and capricious” for EPA not to consider costs could raise the bar for future regulations. EPA claims MATS will cost $9.6 billion annually but produce total benefits of at least $37 billion to $90 billion per year, preventing as many as 11,000 premature deaths and 130,000 asthma attacks, while eliminating 5,700 hospitalizations and emergency room visits and 540,000 missed workdays. However, only a fraction of the benefits — $500,000 to $6.2 million annually — are directly related to cuts in mercury emissions. The remainder are “co-benefits” that arise not directly from reducing toxic emissions, but from reductions in particulate matter and carbon emissions expected to result from the standards. Critics say EPA has engaged in over counting, citing the same co-benefits to justify multiple EPA regulations. The MATS case, which turns on an interpretation of section 112 of the Clean Air Act, also could have an impact on challenges already filed to EPA’s proposed greenhouse gas rule, which the agency is pursuing under section 111(d) of the act. A suit by coal mining company Murray Energy argues that it is illegal for EPA to regulate generating plants under section 111(d) because power plant emissions are already regulated under section 112. If the Supreme Court rejects the mercury rule, it could remove that as a basis for a challenge on the carbon rule, some say. But MATS, 25 years in the making (see related story), will have a major impact regardless of the court’s ruling. 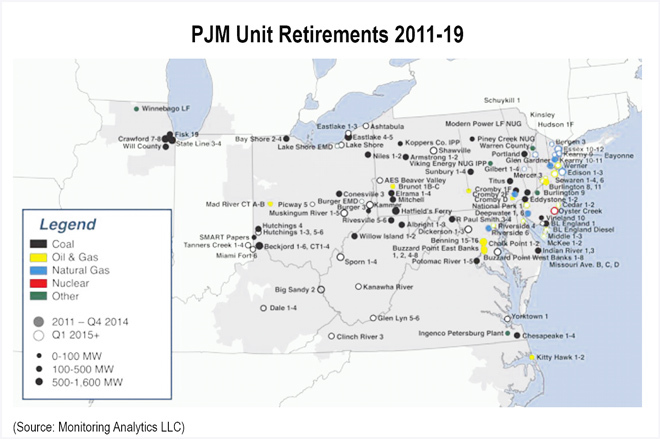 In PJM, 120 generating units totaling about 12,500 MW have indicated plans to retire by 2018. The plants average 48 years old, with some as old as 67. Only four of the units, totaling 425 MW (3.4% of total capacity at stake), are less than 40 years old. At the end of last year, AEP had generating capacity of almost 37,600 MW, more than 23,700 MW of it coal-fired. It plans to retire 6,500 MW by the end of next year, including 5,400 MW in PJM. AEP said a decision to remand or suspend the rule could impact certain aspects of the operation of environmental controls that are already installed or are currently under construction. “For example, there could be greater flexibility to operate selective catalytic reduction systems and SO2 scrubbers if they are not needed to achieve the mercury and acid gas limits under the MATS rule, but are only required to achieve compliance with the market-based CSAPR programs,” Ridout said. 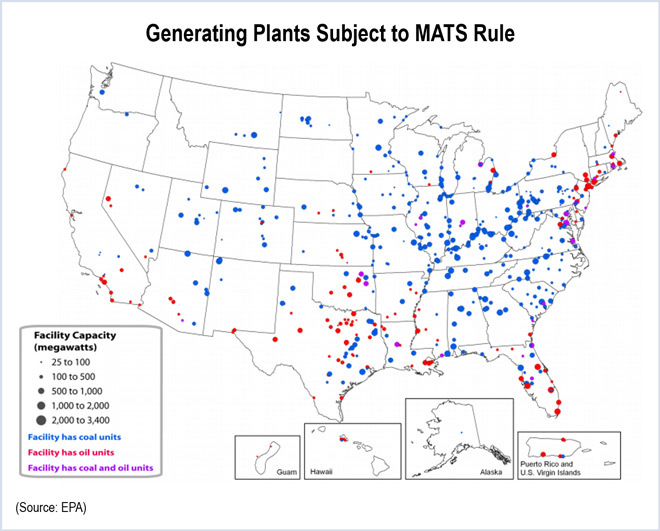 FirstEnergy cited MATS in announcing in January 2012 it would retire six coal-fired plants totaling 2,689 MW in Ohio, Pennsylvania and Maryland by September of that year. The closures were projected to affect about 529 employees. Retirements of three Ohio plants — Eastlake, Ashtabula and Lakeshore — have been delayed under reliability-must-run agreements. The retirements will leave FirstEnergy with six coal-fired plants totaling 9,228 MW in Ohio, Pennsylvania and West Virginia. Most of those being retired are 500 MW or smaller and served as peaking or intermediate generators; those being retained are 1,000 to 2,500 MW baseload plants. PJM’s reliability concerns also led East Kentucky Power Coop. to delay retirements of Dale Station Units 3 and 4 until April 2016, a year later than planned. EKPC closed Units 1 and 2 of the Clark County, Ky., plant about a year ago. EKPC said Units 3 and 4 would be maintained in case market and regulatory conditions allowed their retrofit or conversion. The plant, with a capacity of 196 MW, began operating in 1954, with the newest unit dating from 1960. “If the Supreme Court makes a decision that changes the rules on MATS, our board would carefully look at that decision to assess whether our plans should change,” said EKPC spokesman Kevin Osbourn. EKPC, which has invested nearly $1.5 billion in two new coal-burning units and retrofits to older units, said it fears those investments could become stranded as a result of EPA’s Clean Power Plan, which will require Kentucky to reduce its carbon emissions by 18% from 2005 levels by 2030. But the additional regulations won’t necessarily be a bad deal for utility investors. “To the extent we install additional controls on our generation plants to limit CO2 emissions and receive regulatory approvals to increase our rates, return on capital investment would have a positive effect on future earnings,” AEP told investors in its 2014 annual report. “Prudently incurred capital investments made by our subsidiaries in rate-regulated jurisdictions to comply with legal requirements and benefit customers are generally included in rate base for recovery and earn a return on investment. We would expect these principles to apply to investments made to address new environmental requirements. The Supreme Court ruled that EPA acted “unreasonably” when it failed to consider costs before deciding to regulate mercury and other toxic emissions from power plants under the Clean Air Act. Operators of an Oklahoma coal-fired generator seeking a temporary reprieve from the EPA mercury rule received an assist from FERC.